At this time of year, evening is a great time to visit the Garden. Besides not being as hot as it can be during the day, the lighting is not so harsh and the flowers are not so noticeable. The Garden is green and serene. Most people enter the Garden here and head up to the Tower. This is where the policeman once stood. 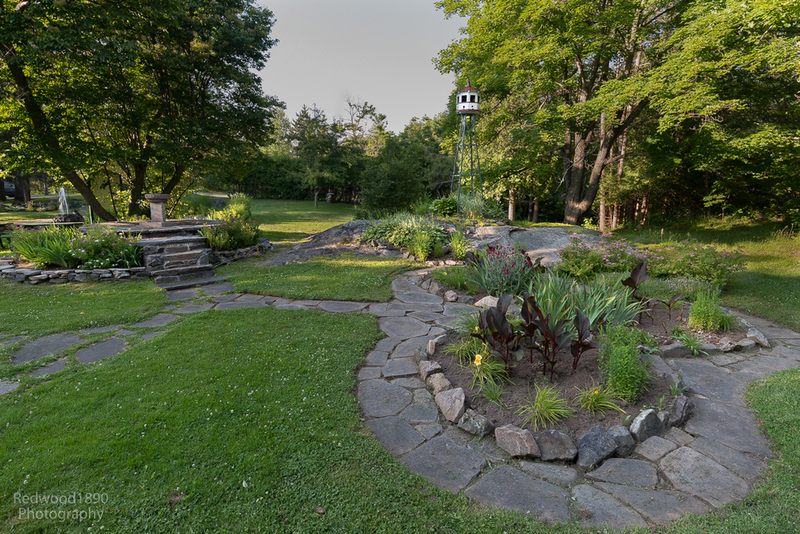 After making the climb to the top to admire the view, the rest of the Garden can be enjoyed by following the paths that were laid by the Ontario Forestry Branch firefighters back in the 1920's. 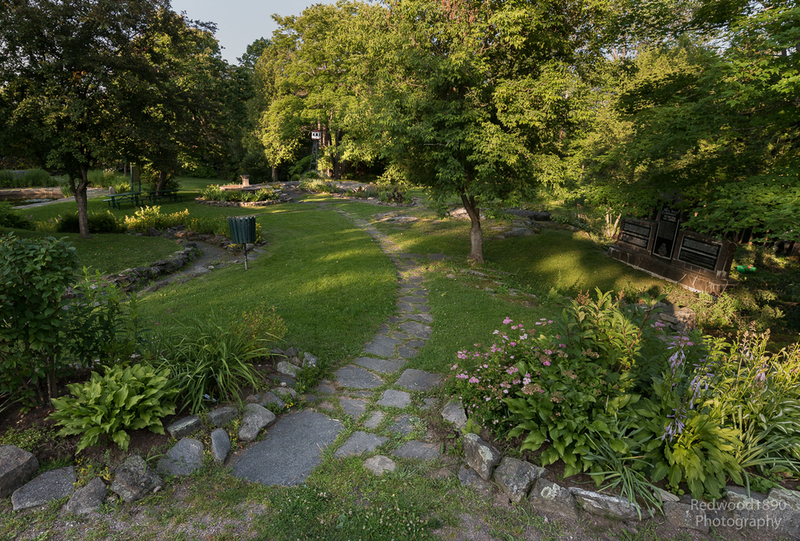 We follow this path from the Rock Garden at the base of the Tower over towards the Sundial and Birdhouse. The Birdhouse is a model of the original Fire Tower. It is perched atop an exposed rock (there are quite a few in the Garden). The "trefoil garden" ... three round beds encircled by flagstone is usually filled with annuals and flowering perennials. This year there are cannas and Stella d"Oro daylilies. ... and over towards the pond. Beyond the pond there are a few paths leading nowhere, having been cut off by the road that was built to create a driveway for the Museum. We can only imagine where they lead to in days gone by. We find ourselves, though, at the "front walk" to the Ranger Cabin. We climb the stairs and overlooking the pond, realize that we have missed a few of the pathways and decide to go around again and see things from a different perspective. Here's the view back towards the Tower from where the birdhouse is perched. One more time around the pond to watch the fish enjoying the cool evening (they hide under the waterlilies when the sun is high) and we head back up towards the Tower. Clockwise this time, around the base of the Tower (and maybe a second climb to the top?) and we head back through the pillars like many generations of visitors before us, reminded once again how lucky we are to have this special place.